A question that's popped in many minds since the Arab spring started dislodging long entrenched regimes in the Arab world is - Will China go the same way? Almost all the Arab world dictators have fallen in past 10 months. In Dec 2010, no one had seen it coming! Do you think the same can repeat in China one day? If yes, when? Piyush Joshi why will this happen in China? Aditya Jain The day China enters in a war with India. All the attention of armed forces and intelligence agencies of China will be on India and that will be the end of China's communism. Nitesh Arya not in this decade..
Abhishek Sharma It is said that Chinese communists have grown old and they fear to hand power to younger china, well lets hope for the collapse of old and stiff Communist rule in China. Adhiraj Dare The day when someone grows stronger than China.. US certainly cant afford to do this to its biggest lender.. Cant see happening this in the next 20 years or so..
Himanshu Khandelwal This will happen anytime from now, the thing which trigger this will be the cultural globalization which has already started. As more n more people from china come across the liberty enjoyed by people of other demography, they will start demanding the same for them n then starts the great collapse of Chinese communal ism. My prediction is towards the end of this decade may be around 2017-18. Claire Mansha Swami it might be a most wanted Fall to come up!!!!! Saurabh Jaiswal I think the china will re-engineer the concept of communism and yet retain its soul. Bharat Jhalani One of the main reasons behind Arab spring was the inflation in essential commodities tripled with the slowing growth and rising unemployment (as they say..empty mind is the devil's workshop)... Interestingly China has started facing some of the same problems (High inflation, tightening monetary policy and slowing growth).But unemployment is not a pressing problem in China yet (its just 6.5% as compared to 12% in Egypt). A lot depends on the the way Euro crisis shapes up. If Greece falls, it will have a domino's effect on rest of the Euro zone especially in Italy,Spain & Portugal.. And the repercussions will definitely be felt at China. Communist Party must divert some part of its huge $3.2 trillion reserves to Euro zone if it needs to rule it own backyard 'Peacefully'!! 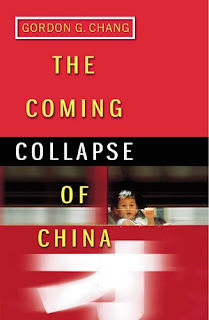 Shivalik Daga Even if the Chinese 'dictatorship' crumbles I doubt it will result in the sort of economic logjam like it did for the USSR..the Chinese are already reaping the benefits of a market economy and they already have a lot of capitalist institutions in place. But one major impact I can think of if the communists lose power is that China's population would definitely grow faster in the small to medium term as the OCP is repealed : Imagine generations of Chinese people have grown up without knowing what it means to have a sibling! Mukesh Muwal It is comparatively very easy to protest against one person or a few people than to topple an empire of 7.5 crore people. Anyways, Chinese people doesn't have much reasons (b'coz they are employed) and sources too, to recognize the real face of govt. and above all, only extremely committed and uneducated people protest for a cause, I think china lacks both. Fall of Chinese communist party is not possible this way but it can happen if people within the party protest against it. Herwig Streubel If it is going to happen too soon it will be very bloody! But it will happen. Hopefull a sort of Chinese Gorbatshev will rise before that happens. Tumuluri Rammohan ‎"You either die a hero, or you live long enough to see yourself become the villain"
Rizwan Khan some one china dictator needed in India, who at least people work and not waste time on facebook like me. Gautam Kumar CHINA CHINA CHINA....ab aur nahin...In China the new generation that is coming up has not seen the adversity of the olden days. The orderly succession that is managed till now will be a problem in future coz the discipline of communist part has gone. Today smarter, younger ones don't want to sell ideology they want to sell coca-cola. China getting deprived of ideology...its dependency for raw mat on other nations increasing...domestic consumption doesn't seem to rise...not in near future but eventually it will fall...as of know world seems to be without leader. A good brainstorming this was! Once I read a book and I came across a statement in the prologue- "Every nation has it's destiny". So somewhere I feel China's preordained fall would come soon. I also believe that the gunpowder is ready and it just needs a spark and there will be an explosion just like in the case of Jasmine Revolution. The Tintin saga - now in a theatre near you!